Why can't my Water Damage Mitigation Company give me an estimate? Getting estimates is a natural part of the insurance claims process, but that's not true of water damage. Since any delays will result in further damage and mold contamination, time is of the essence. It's considered standard practice in the construction industry to expect an estimate of the cost prior to the work being performed. Why then would a Water Damage Mitigation Company refuse to provide an estimate? There are actually a number of reasons why estimates are not normally supplied for water damage drying and mitigation services. First and foremost, when a water damage loss or flood occurs to a property, time is of the essence. Even small delays in getting the mitigation and drying started can result in a substantial amount of additional damage, and associated cost, to the property. The Insurance Industry, which has spent countless billions of dollars paying water damage claims, does not require Mitigation Companies to provide a quote prior to performing the work. These Insurance Companies have learned that the delays associated to waiting for an estimate only increases the overall damage to the property as well as the amount the insurance company ends up paying out in damages. The property owner's insurance policy typically includes a clause which places an obligation on the property owner to take action to mitigate further damages. This requires the property owner to protect the property from this further damage. In a water damage loss (pipe break, etc.) or flood, proper and timely drying and mitigation are considered necessary to stop secondary water damage. The water will continue to wick from wet building materials to dry materials, often in hidden locations such as inside wall cavities, etc., until there are no longer any dry materials thereby causing this secondary damage. Timely, professional mitigation initially slows and finally stops this process. If the property owner fails to mitigate a water loss in a timely manner, the Insurance Company can, and will, refuse to pay for any additional damage (secondary damage) caused by this delay. As a result, secondary property damage as a result of unnecessary delays while the property owner waits for price quotes could cost the property owner directly. In addition to secondary water damage, Mold contamination is also a factor. Delaying mitigation, even less than a day in some cases, can result in the beginning of mold growth. Once mold begins to grow, costs can skyrocket, increasing the overall job costs by 4 to sometimes 10 times what would have been necessary prior to mold contamination. Prompt, professional, and timely drying and mitigation is essential to reducing costs when a water damage loss or flood occurs. Any delays, even delays associated to getting estimates, generally only increase the overall cost. Last, it is virtually impossible for a Mitigation Company to accurately estimate the price of a water damage drying and mitigation job. There are too many variables that can affect the nature of the drying, and the time and labor that may be needed to properly dry out a building. As the property dries, water infiltration, by its very nature, will still continue to wick from wet to previously dry areas until the drying is complete. As well, different building materials dry out at different rates. For instance, drywall is more easily dried out when compared to plaster. Also the humidity and temperature within the home, as well as the weather conditions outside, can often affect the drying and mitigation services to your property. It is impossible for any professional Mitigation Company to predict where water will migrate during the drying process or how quickly the property will dry. This makes it impossible to provide any accurate estimate. Because of this, it is important to only use companies you know you can trust for your water damage drying and mitigation needs. Disaster Blaster is trusted by the Insurance Industry (both Insurance Adjusters and Agents), many Commercial Property Managers, and the local Real Estate Industry for their water damage drying and mitigation needs. 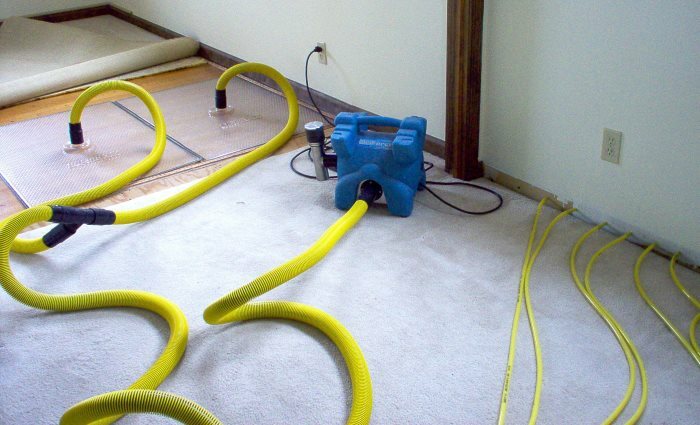 Should you have a need for Water Damage Mitigation, please Contact Us today! We have crews available 24 / 7 to respond to Emergency Water Damage Claims.